(Newser) – If you're worried about your kids not getting enough shut-eye because of the time they spend on their smartphones and computers, playing Xbox, or watching Netflix, new research may ease that parental guilt—somewhat. The BBC reports on a new study out of Oxford University that found any ties between screen time and children's sleep were "extremely modest," and researchers were even able to put a number on how much sleep was lost at night with each daily hour of screen time: three to eight minutes. 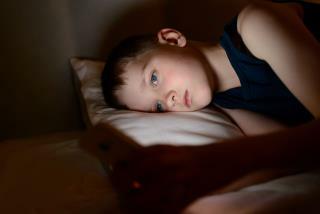 "Digital screen time, on its own, has little practical effect on pediatric sleep," the study published in the Journal of Pediatrics notes, adding that "contextual factors surrounding screen time exert a more pronounced influence on pediatric sleep compared to screen time itself." I guess that they forgot to include that this 'research' was actually funded by the makers of Microsoft (Xbox) and Sony (PS 4)! Correct! Kids will stay up later if school time is shifted. Hours spent on phones and video games just displace hours that might have been spent constructively elsewhere. The same can be said for time I spend reading comments on Newser.